No dog is allergic to fleas but his immune system can be over-challenged by flea prevention treatments! Natural flea prevention (like diatomaceous earth) instead of toxic flea treatments insures a healthy immune system. 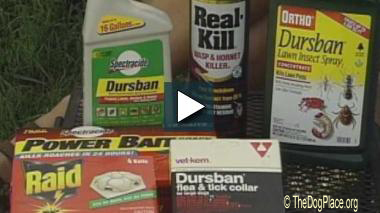 Most of us have resorted to using commercial flea control products at one time or another. These products can present significant hazards. They are pesticides; poisons which are intended to kill living organisms. Many pesticides affect a broad range of living things. For example, organophosphate and carbamate compounds (two classes of pesticides commonly used for flea control) act on the nervous systems of insects and mammals in the same manner. When you use these chemicals, you can affect not only fleas, but your pet and yourself as well. If you think you or your pet has been adversely affected by a pet product containing pesticides, call your regional poison control center for immediate help, and report the incident to the EPA's National Pesticide Telecommunications Network, at 800-858-7378. Most pesticides are neurotoxic, meaning that they cause the nervous system to malfunction, thereby causing death. About 2/3 of available pesticides function in this manner. Flea control products have also caused reproductive problems in laboratory tests. About half of the available products are classified as carcinogens by the EPA, while one-fourth are known to cause genetic damage in at least one test. Almost all pesticides have environmental concerns. Per pound of weight, small dogs breathe more air, drink more water, and eat more food than larger dogs. In addition, young puppies are more sensitive than adults because they are growing and some of their organs are still developing. 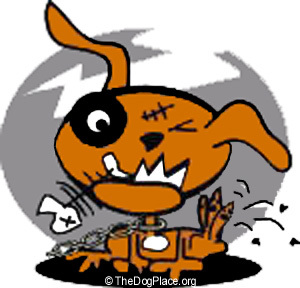 A lesser amount of toxic material per pound can poison a young puppy or small dog very quickly. There are several ways chemicals enter the body. They may be inhaled and enter the bloodstream through the lungs. They may be ingested by mouth, and enter through the gastrointestinal tract. They may also be absorbed through the skin (and paw pads) through direct contact. The good news is, that by understanding the flea's life cycle and targeting your management activities, an effective and least-toxic flea control program is possible. Fleas go through four stages of development: egg, larva, pupa and adult. 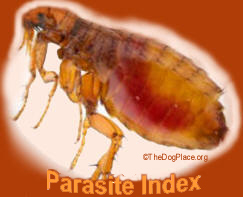 Warm, moist conditions (65-80 degrees F and 70% relative humidity) are optimal for flea hatching and development. A female can lay up to 800 eggs in her lifetime. Eggs are laid both on and off the pet. Those laid on the pet later fall off and accumulate on the floor, in cracks, on furniture, and in dust. The eggs hatch within 2 to 12 days into wormlike larvae. The larval stage generally lasts 1 to 3 weeks, but can exist up to 200 days. The larvae then spin a cocoon and transform into pupae. Pupae remain dormant until they detect a host (by warmth and vibrations) and hatch out as adults. The pupae stage lasts from 1-2 weeks under favorable conditions but can extend to nearly a year. After emerging the adult fleas immediately seek a blood meal. Adults can live 1-2 months without a meal and can survive 7 to 8 months with just one meal. So, as you can see, when conditions of heat and humidity are favorable, fleas can emerge from seemingly out of nowhere to torture your pet. In addition to causing discomfort and skin lesions from allergic reactions and scratching, fleas can transmit tapeworm and bacterial infections. Vigilance and preventive techniques allow most pet owners to keep flea populations under control without using poisons. An effective program must address the flea at all four stages of development. Vacuuming areas your pet frequents, bathing your pet, washing pet bedding, and combing for fleas can effectively keep your flea population at a tolerable level. Fleas tend to accumulate where pets sleep. Try to establish a single, regular sleeping place with bedding that is easily removable and washable. Wash bedding about once a week to break up the flea life cycle. Pick up the bedding by the four corners so that eggs and larvae aren't scattered throughout the area. Keep your lawn cut short and either very dry or very wet. Fleas don't do well in either extreme. Bathing your pet is an effective control measure. It is not necessary to use insecticidal shampoos, most soaps will kill fleas. Use a comb to remove fleas from your dog. Keep a container of soapy water nearby to drown the fleas in. Dish soap works well. Don't crush fleas with your fingers since they carry parasites and disease organisms. Vacuuming floors, carpets, furniture, crevices and cracks once a week is an excellent means of controlling the flea population. Vacuuming is especially effective at picking up adults and eggs. The vibration from vacuuming can result in the emergence of adult fleas from the pupae stage, the newly hatched fleas are vacuumed up prior to ever meeting you or your pet. 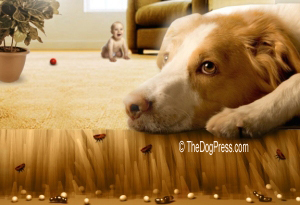 Steam cleaning carpet kills fleas in the adult and larval stages. However, the steam can trigger the hatching of the remaining flea eggs a few days later but vacuuming religiously will take care of most of the newly hatched fleas. Vacuum more frequently if the flea population increases, every 2-3 days during the peak season. After vacuuming, the bag must be dealt with immediately or the fleas will escape and re-infest the area. Predatory nematodes that prey on flea larvae and pupae as they are developing in soil are available commercially. The nematodes are mixed with water and watered in to lawns to reduce outdoor flea populations. Nematodes are available from Gardens Alive! (812-537-8650) (www.gardensalive.com). Gardens Alive! is a wonderful source for environmentally friendly, nontoxic home and garden products. Another good company with information related to flea control on their website is Planet Natural.www.planetnatural.com. Desiccating dusts, such as diatomaceous earth and silica aerogels, kill fleas by drying them out, causing the insect to lose moisture and eventually die. Always wear goggles and a dust mask during application to avoid breathing in desiccating dusts. Cover or remove equipment that can be damaged by dust. People with respiratory problems should not use diatomaceous earth. Be sure not to use glassified diatomaceous earth manufactured for use in swimming pool filters, it causes the lung disease silicosis. Some pest control companies are advertising a natural flea control through use of boric acid (another desiccant material) in cracks and crevices. Diatomaceous earth or silica aerogel can be applied to pets and their bedding. Both are desiccating agents. Work in using a brush or broom. Vacuum afterwards to remove loose dust. Use of brewer's yeast tablets make your dog less attractive to fleas, as the smell is excreted through the skin. Adding a spoon of apple cider vinegar to the water bowl will make the skin more acidic and unpleasant to fleas. You can also use a 50:50 dilution in a spray bottle and dampen the coat with the solution. Insect growth regulators are not pesticides, but rather chemicals that arrest the growth and development of young fleas. These include methoprene, fenoxycarb and pyriproxyfen and the popular lufenuron (Program®). Alternatives also include newer pesticide products sprayed or spotted onto pets, such as fipronil (Frontline®) or imidacloprid (Advantage®). Particularly when used in combination with physical measures, the safety and effectiveness of these newer chemical products makes the continued use of pet products containing Organophosphates -- and their attendant risks for humans and pets alike -- unnecessary. You can make your own nontoxic flea repellents with some natural aromatherapy ingredients. These essential oils work well as repellents; add a few drops of these, in varying combinations, in a spray bottle filled with water: You could also make a flea collar by rubbing a few drops of these essential oils into a cloth collar or bandana for your dog. Be sure to refresh weekly. Horrifying cases of Dow Chemicals causing severe damage to children.